1 oz. 2 oz. 8 oz. 1 lb. 20 lb. $3.99 to $479.99 & FREE Shipping on orders over $59 $35. Medium Plus toast cubes manufactured by StaVin. Cubes have a longer contact time than traditional chips do, which make them better for long-term aging of wines and beers. Also, longer contact time means longer extraction of flavors (3-6 months), which leads to a more complex combination of flavors. Chips are usually done giving flavor after a week, there by contributing a harsh, flat oak flavor. 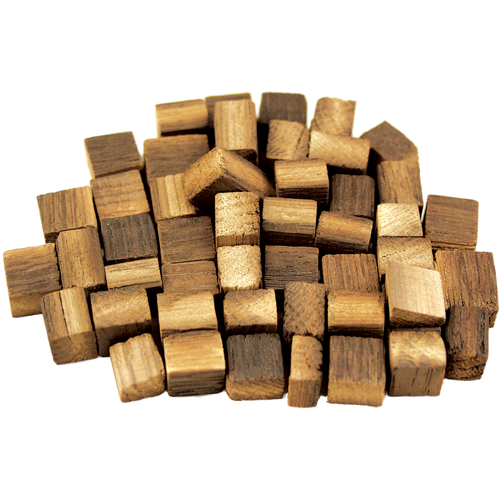 Our cubes are fires toasted and cut by Stavin, a leading supplier of high-quality oak alternatives to top commercial wineries. Click here for a PDF of the MoreWine Oak Cube Dosages. Learning to finish my wines. I bought this for the quality and complexity of tannins released over a longer time period. It's affordable and more than adequate. I already have the infusion tubes. It works. Great product for small Home wineries. I can’t afford barrels, so these really help give my wine some nice oak structure and tannins... leaving the impression that it had spent time in an actual barrel! Very easy to sanitize and use in my 6gal. carboys.